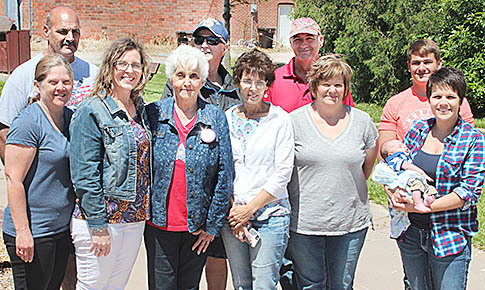 Family members on hand with Donna Merten (third from left) at the Memorial Day flag raising in her honor included (front, l.-r.) Michelle Merten, Brea Kelley, Cindy Carlson, Lori Merten and Taylor Johnston (with baby Everette Johnston); and (back row) Terry Merten, Victor Carlson, Randy Merten and Jonathon Merten. Donna Merten, a long time active member of VFW Auxiliary to Post 736, and American Legion Auxiliary, Manderson Lehr Post 162, was honored with the annual “Living Auxiliary Member” award on Memorial Day, May 29. The award was presented by Leon Magsamen. This award is presented each year on Memorial Day. The recipient receives a plaque, and a flag is flown in her honor at the downtown mini-park. Mrs. Merten has held several offices in both auxiliaries. Her late husband, Don, was honored with the “Living Veteran” award in 2013. She was born at Albion Feb. 14, 1937, and has lived in or near Albion all of her life. She was married to Don at St. Michael’s Catholic Church on May 25, 1955. She is a member and volunteer in St. Michael’s Church in Albion, where she is a member of the Altar Society. She also volunteers for activities at Good Samaritan Society Wolf Home. She enjoys painting, flowers, playing cards and animals of all kinds. Mrs. Merten has five children, 15 grandchildren and 27 great grandchildren.